So many people told me to wait until we have enough money and personnel. I remember saying to myself, the money is God's job. He is in charge of all the riches! As for the personnel, God passed that unto us, when He said go and make disciples of all men! The rest God will put in place. All that is needed is Obedience! You might be saying I wish it was all that easy, well it is! We just have the habit of making things more difficult than they are. God is faithful and is in charge of all things, I know if we are faithful with the little, He will take us to much bigger and better things! 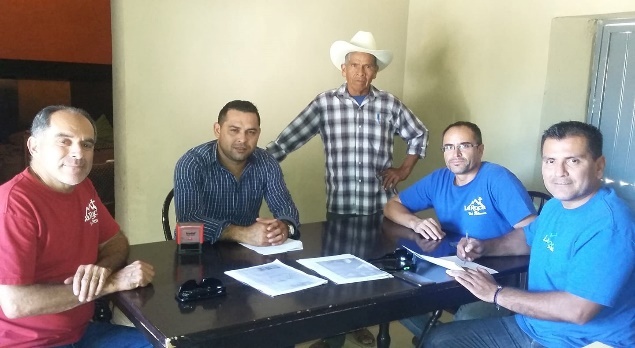 Sonora update; Well, we finally have the documents all signed and acknowledging La Roca Ministries as the owners of 3.8 acres in Tanques of Sonora. Who could have imagined this happening in such a short time? We just went there this February to see what God had in store for us, and all I can say is Wow! The first building is coming along great with nice red brick all around. We are going to use these same bricks on all the structures, giving us a nice rustic look. So please continue to pray for us as we have taken on this challenge. At the same time, I have started looking for two of our staff to go to Sonora and be stationed there. One that I have considered is David. He has been with us at the ranch for over 4 and ½ years, and has been very faithful. He is our driver who has faithfully brought in our water to the ranch, but he is also a teacher for our recovery program! David and one more person which I have not chosen yet, will go work alongside with the staff in Sonora. So keep David in your prayers as he is willing to go where ever God sends! We are also going to start bringing our staff from Sonora one by one to Tijuana, so we can train them and they can see with their own eyes how things are done here. In that manner they can go back with a better understanding and ability to see the bigger picture of what God has called all of us to and feel more part of La Roca family! Also, we are very excited to announce that Carlos Herrera, also known as Charli, will be coming on the team full time. He has been with us since he was 12 years old. He graduated from college with an engineer degree and started working with Jersey, which is one of the major milk companies in Tijuana. He told me that He has always wanted to serve as a full time missionary for La Roca. So we are all excited to have him soon on the team and all that he brings to the table. He is bilingual and will be helping us with groups as well. Please keep him in your prayers as he makes this transition. With so much going on, I always forget to invite you all to come down with us and help in any way that you can. For example, with all the new regulations we are being told that we have to replace all the electrical that is underground at the ranch. So we need help. We also want to bring in solar panels, especially for the kitchen. We have a small fridge that runs on propane, and it does not have the space to hold all the food that we need for the men. So we need something much bigger; solar is the solution. The list of needs goes on, but thank you so much for what you have done and what you will continue to do in service to God through La Roca Ministries. We appreciate you more than you realize! Thanks for being part of La Roca family! Where Real Life, Real Hope and Real Change takes place in many people’s lives. My prayer in closing is that the Lord will help us remember the poor and needy and your special love for them, especially as we approach Thanksgiving and Christmas. We ask the Lord to multiply the gifts and that He will be glorified as we share our bounty with those in need, Amen! Your missionaries Carlos and Rossy and the rest of the team!